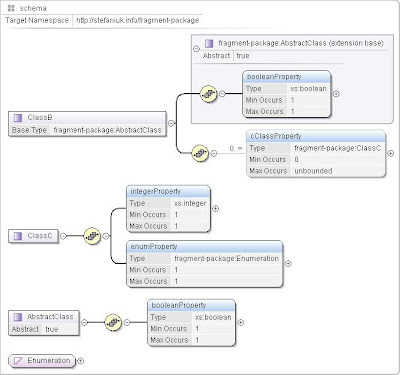 StarUML is one of the best free UML modeling tools. It has an inbuilt generator that makes it possible to create documentation or implementation (supports few output formats - like as Microsoft Word, Excel, PowerPoint and Text-based). The main disadvantage is that it is impossible to validate or transform the model non-interactively. Detaching a tool from human interaction is crucial when you would like to establish an automated process like Continuous Integration. Because there is no other possibility I decided to transform StarUML native file format directly. I prepared a simple model structure as a base for tests. It contains two packages with five classes, with aggregation, extending and enumeration. The class definition in StartUML file looks a little too verbose but clear enough to transform it using XSLT. Each package transforms to a separate schema document with namespace subdomain derived from package path. Stylesheet has less than 200 lines and from the original model generates two valid XML Schema files (first is imported to second one). 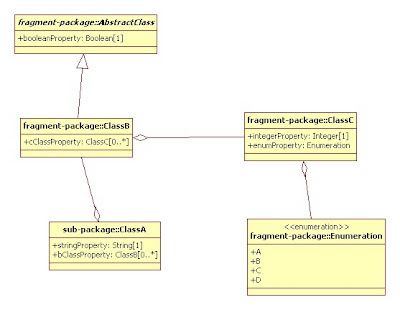 Objects transformed from the fragment-package are visualized as below. The tool currently supports single file StarUML documents (without units). You can get it from my files site.